Textio, a service that helps job recruiters by flagging both good and poor phrasing, now aims to be a real-time writing coach. The best way to make your writing better is to show it to someone who knows the topic at least as well as you do. That someone can now be an artificial intelligence system that reads and learns faster and more deeply than a human can, says linguist and cognitive scientist Kieran Snyder. Her company, Textio, has launched a new AI web service called Opportunities that she says can figure out what you are trying to say and suggest better ways to do it—within 0.3 seconds. That may seem minor, but any tool promising to grab a candidate’s attention could be important in hot technology sectors where scarce talent like software engineers have their pick of super-lucrative job offers. Textio’s work is interesting beyond job recruiting, though. It shows the potential of AI to not only understand complex thoughts, but also the huge amount of work required to develop that understanding in even one topic area. Were Textio coming out of nowhere with this promise, it might be a hard sell. But the company, founded in 2014, claims that thousands of companies are already using a simpler version that flags good and poor wording in a text—such as sexist language and stale clichés like “team player.” Big clients include Bloomberg, Capital One, Microsoft, Slack, and Twitter. 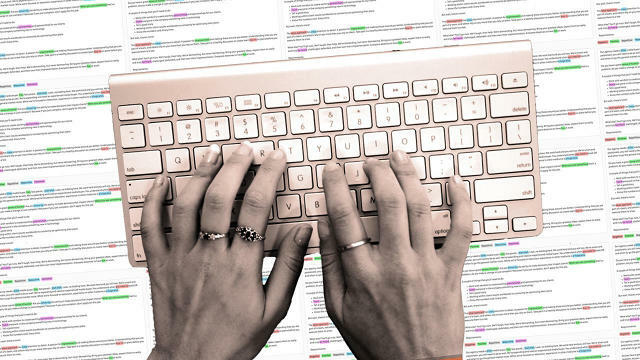 Textio gleans that insight by using AI to ingest millions of job postings, see how the language is evolving, and rate phrasing by more than a half dozen criteria such as the number of applicants a job gets, the percentage qualified enough to get interviews, and how long it will take to fill the position. “Big data” is no longer a cool phrase, for instance. “Awesome” is a popular adjective in job listings for San Francisco, but not for New York City. “Awesome” is a popular adjective in job listings for San Francisco, but not for New York City. Those little changes took the posting’s overall rating from Fair to Above Average. What’s significant is not just that Textio has a cute little scoring system for verbiage, but that major corporations think it’s worth paying for (starting at $129 per user per month). The process Textio goes through is a good illustration of how computers parse words, using a method called Natural Language Processing (NLP). First, the service finds all the “potentially meaningful phrases,” as Snyder calls them. In “cutting edge science” for instance, “edge science” doesn’t mean anything, but “cutting edge” does. The algorithms then come up with all the alternatives to these meaningful phrases and weed out any that don’t fit the context. “Cutting edge” doesn’t refer to knives in a job description. Finally, it takes the options that are left and checks them against Textio’s inventory of words and phrase to recommend ones found in the most-successful job descriptions. It’s like Moneyball for writing. It will be a long way to a writing teacher in a box—a service that can analyze text on all kinds of topics and propose edits to make them better. However, AI can obsessively track constantly changing vogue terms and writing styles in a specific area and make recommendations based not on intuition but on statistics.